Following his recent collaborations with the Jamaican roots collective Inna De Yard, the man of the moment Winston McAnuff, returns with Big Brothers, the second album he’s released with French accordionist and producer Fixi. Big Brothers was recently released on Chapter Two Records and finds Winston McAnuff ruminating about the state of the world in 2018, which he views from a Rastafarian perspective. This he’s been doing since the seventies . That was when Winston McAnuff became a familiar face within the Jamaican roots reggae scene. Back then, Winston McAnuff was better known as Electric Dread during his seventies heyday. Sadly, the success didn’t last, and in Winston McAnuff’s life took a series of twists and turns over the next three decades. As the new millennia dawned, there was a resurgence of interest in Winston McAnuff’s music and by 2013, he had released three solo albums and two collaborations. Soon, two became three when Winston McAnuff and Fixi who first met in 2005, released their debut album A New Day. This transformed Winston McAnuff’s career and suddenly his profile was rising. Buoyed by the success of A New Day, Winston McAnuff and Fixi headed out on the road to tour the album. This was an old school tour with hi-jinx and hard living the order of the day for Winston McAnuff and Fixi toured Britain and Europe. Just under two years later, as the bells rang as 2015 dawned, people across Europe looked forward to a new year. However, in some parts of Europe many people had nothing to celebrate, including those living in the Jungle’ immigration camp in Calais in 2015. That was why Winston McAnuff and Fixi’s beat boxer partner Markus (Marc Ruchmann) decided to put on a party Jungle immigration camp to celebrate the dawning of a New Year in 2015. The party was meant to bribing some much-needed happiness and humanity to those waiting at the camps to hear their fate. Despite the climate of fear for what the future held, there was laughter, and songs during the night while the bells rang out every two hours to celebrate the dawn of a new day in a different time zones. This celebration proved inspirational for Winston McAnuff and Fixi. When the time came for Winston McAnuff and Fixi to record their sophomore album Big Brothers, they remembered were inspired by the friendship and fraternity that had been a feature of that party in the Jungle immigration camp. The more that Winston McAnuff and Fixi thought about that night, they realised that friendship and fraternity was the secret to their musical relationship. When Winston McAnuff and Fixi thought about their musical relationship, they realised that they first worked together on their Paris Rockin’ album collaboration in 2005. Two decades later, and they were preparing to record a new album Big Brothers. Joining Winston McAnuff and Fixi was vast cast of musicians and vocalists. The band features Afrobeat drummer Cyril Atef, bassist Elise Blanchard, keyboardist Camille Ballon and the maloya of Olivier Araste from the band Lindigo. They provide the backdrop for two generations of the Inna De Yard family who add vocals on Big Brothers. This includes The Congos’ Cedric Myton, and Kiddus I, Derajah, Var and Winston McAnuff’s daughter Nadia McAnuff who jibs forces with Angolan vocalist Pongo on Big Brothers’ lead single One Note. 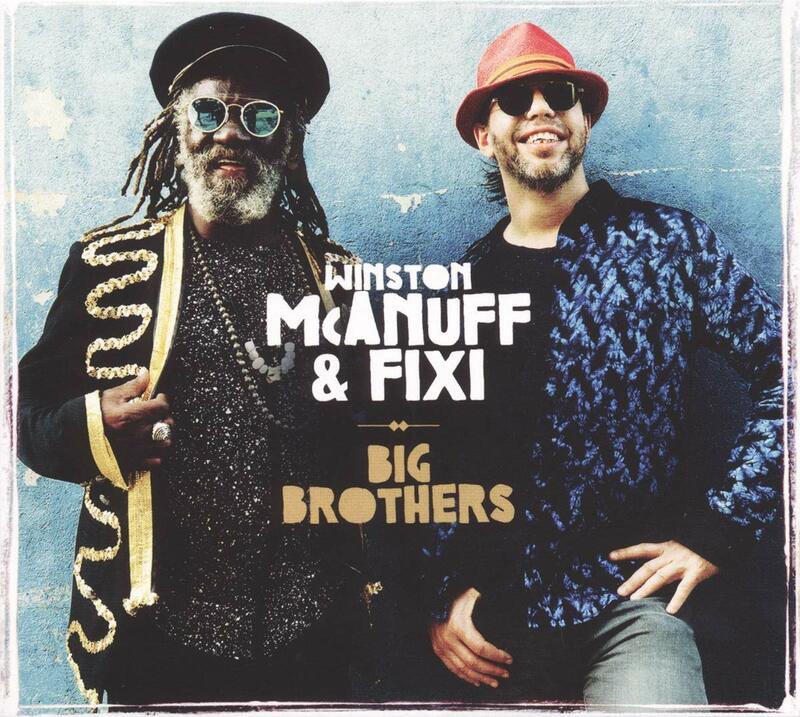 Big Brothers finds Winston McAnuff and Fixi continue their theme and philosophy of connectedness. This is revisited on Big Brothers which Winston McAnuff, who nowadays is regarded as one of reggae’s elder statesman, wrote as he travelled around Jamaica. The songs he wrote became Winston McAnuff and Fixi’s album Big Brothers. It’s a powerful, poignant and sometimes politically charged album.Big Brothers features everything from life maxims and parables to wishes and wants that give the album an intensity and fierce contemporary sound. Especially songs like Think, which can only be desired hard-hitting and straight to the point as Winston McAnuff advises: “think, observe and listen”. Crying for Love was written by Winston McAnuff on top of the cliffs of Dover, and is an anthem for all those who have braved the seas in the hope of finding a land to call home. Then on Black Bird Winston McAnuff unleashes high-pitched caws and becomes the narrator of a child’s lullaby. One song that should ring with most people is If You Want It So Bad where Winston McAnuff remind the listener of their our responsibility is seven word: ”Now you’ve got it, please respect it.” It’s one of the highlights of Big Brothers. With its fusion of Jamaican and Angolan vocals that are accompanied by Cuban pianos, bursts of glistening electronics and a production that emits rays of sunshine is a powerful, poignant and politically charged album of genre-melting music from that is built around the friendship between Big Brothers Winston McAnuff and Fixi.